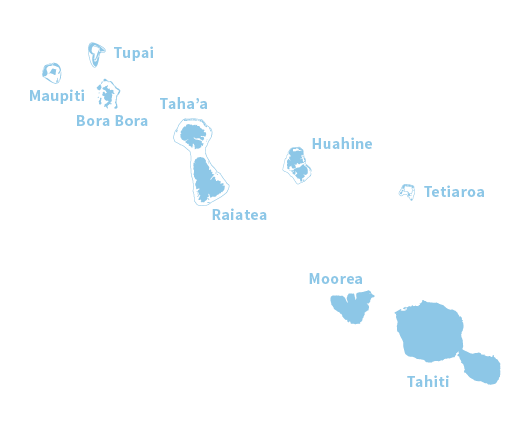 Discovered by Europeans in the 18th Century, the Australs are located 373 miles (600 km) south of Tahiti’s capital city. 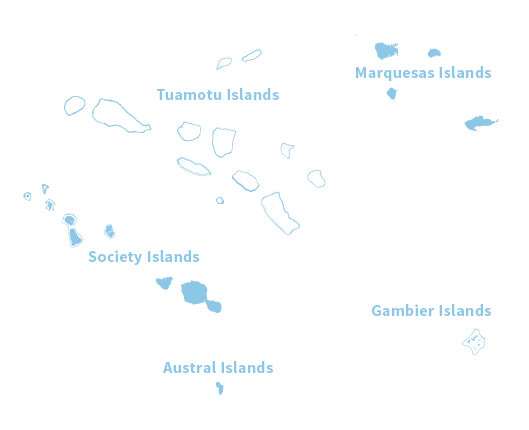 The archipelago is made of seven islands, five of which are inhabited and four of which are accessible by air. 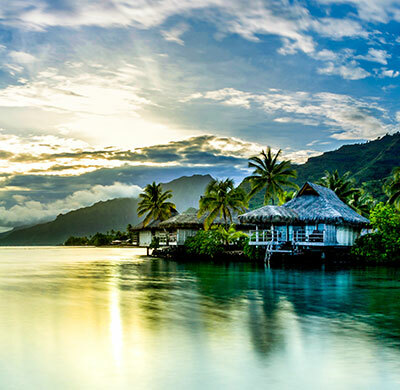 An untouched and mysterious land where white sand clashes with the intense blue of the lagoons, the Australs are off the beaten track, offering a memorable and unique experience in The Islands of Tahiti. Breathtaking landscapes, from sheer mountains to valleys and high plains, these islands are famous for their farming activities. Quite a few archeological remnants hide on each island, bearing witness to a well organised pre-European community of rich cultural and religious practices. The cliffs and caves of the Austral Islands are places of legends. These areas used to be old burial grounds but are now a place to watch humpback whales frolic in the waters just offshore. The whales come to the Austral Islands from August to October each year to give birth. These contrasting sceneries blend well with the friendliness of the inhabitants. Visit colourful, picturesque villages to discover the handiwork of islanders who mainly live off their artwork. Also enjoy watching fishermen, farmers and basket weavers at work. You’re not likely to leave without a hat or woven basket to remind you of your magical time in the Austral Islands. 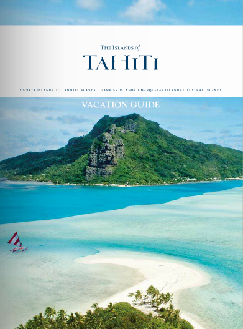 The Austral Islands are a rare opportunity to discover The Islands of Tahiti in a different light. Humpback whales arrive in Rurutu each year. They come between August and October to mate and give birth in Rurutu’s amazingly clear waters. Mothers and calves swim under the water while males and females communicate offering whale watchers a moment of pure bliss. Numerous pre-European archaeological remnants can still be found around Tubuai. Most of them hide abandoned behind lush vegetation, but some of them are well looked after and are worth a visit. Please ask a professional guide or your hosts in order to visit these ruins. 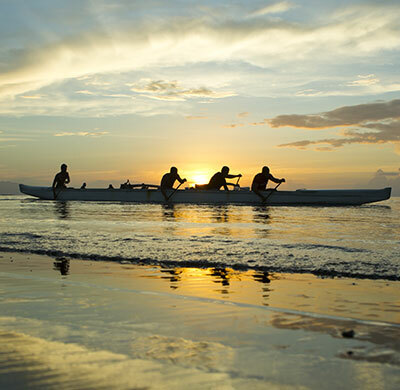 Your guides will tell you the stories of the marae and the island’s legends in a unique authentic way. The island is a great mix of beautiful white fine sand, deserted beaches, a crystal clear lagoon, lush valleys and varied farming, majestic peaks and hiking trails. Land and sea blend nicely to provide travelers with a enough experiences to complete a bucket list. The island was formed by a pair of consecutive volcanic hot spots, which created unusual mountains circled with coral cliffs. This natural occurrence led to the island’s “Rurutu,” or, “the gushing rock.” Basaltic rocks and a limestone belt offer surprising stalactites and stalagmites around the former lagoon, now a coral reef. The cool climate leads to lush vegetation covering the island’s rocks. The curvy road will lead you through a poetic and impressive tour, combining long, white sandy beaches, beautiful bays and various plantations. Coffee, pineapple, wild basil and lychees abound around these rich lands. Within this pristine environment, just 2,404 inhabitants look after their traditions and organize friendly games. The feast of Tere or island tour gathers all villages and allows the strongest to lift volcanic rocks as heavy as 330 pounds (150 kg). You can best discover the charms of Rurutu by interacting with the local people, such as the mamas, smiling ladies who spend their days weaving specialty materials. Their agile hands make delicate artwork such as pe’ue or mats and also fine woven hats. They are also experts in the making of tifaifai, traditional patchwork blankets featuring exotic patterns and requiring patience and knowhow. Finally, do not miss a whale water ballet, attracting nature and whale lovers and researchers each year. Whales come very close to the coast to give birth, and adventurous snorkelers can share a very special moment with these sea giants. 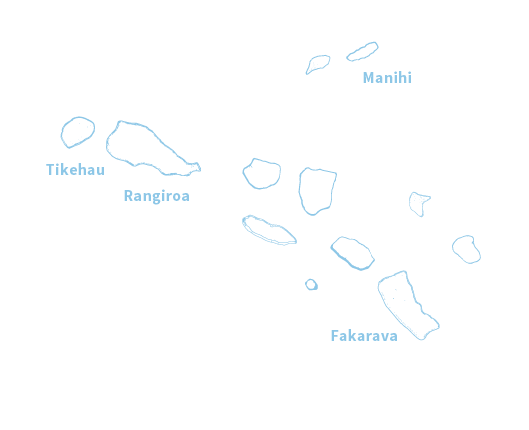 Tubuai is the largest island of this archipelago and hosts the main public and economic services for this island group. Its reef is scattered with fine motu plus coral and volcanic rocks. The huge lagoon, nearly twice as large as the island itself, offers 33 sq. mi. (85 km²) of pure aquatic fun. The mild climate also makes these islands ideal for farming. Lilies are grown around the islands for export and can be seen in the fields as far as the eye can see. The first explorers were struck by the island’s beauty. Toward the end of the 19th Century, explorers Wallis and Cook took a liking to the lush vegetation and crystal clear water of the island. However, the area did not look appropriate for good anchorage given the large barrier reef around the coast. This disadvantage turned into an incredible advantage in the eyes of the famous mutineers of the HMS Bounty. Led by Christian Fletcher, they tried unsuccessfully to settle and built Fort George, which no longer exists. The island features a large lagoon circled by a coral reef consisting of 28 motu. The cool climate allows for agriculture. The inhabitants, living in four different villages, grow taro and coffee but also mango and banana trees. “Raivavae” or “the open sky” is a great place to listen to the sounds of sea bird songs, the swell of the ocean and the gentle wind. Often considered the most beautiful island of the Pacific, the magnificent scenery of Raivavae lives up to its reputation as the Garden of Eden. Floating over an emerald lagoon, the island shelters amazing remnants from the past such as a laughing tiki. Numerous items are kept in private collections at Western museums from an era that witnessed intense pre-European religious and cultural practices. Locals have chosen to keep their island untouched and have developed an ecotourism concept welcoming travelers in a warm and simple manner. Aside from handicrafts, Raivavae is the only island where sewn outriggers are still made, ensuring the visitor a step back in time feeling while on the island. Although Rimatara is the smallest island of the Austral archipelago, it holds a particular charm with many hidden beauties. Around this circle shaped island, it feels as though time has stopped. With just a small lagoon, the island is also one of the last shelters for an endangered bird species, the khul’s lorikeet or vini ‘ura, a bird whose colourful feathers brighten up Rimatara’s sky. Access to the island was by sea until recently. Now you you can now fly from Papeete. The main occupation of the population, aside from farming, is basket weaving and especially the preparation of fara pae’ore leaves (a variety of thornless pandanus) used as a material to make woven items.